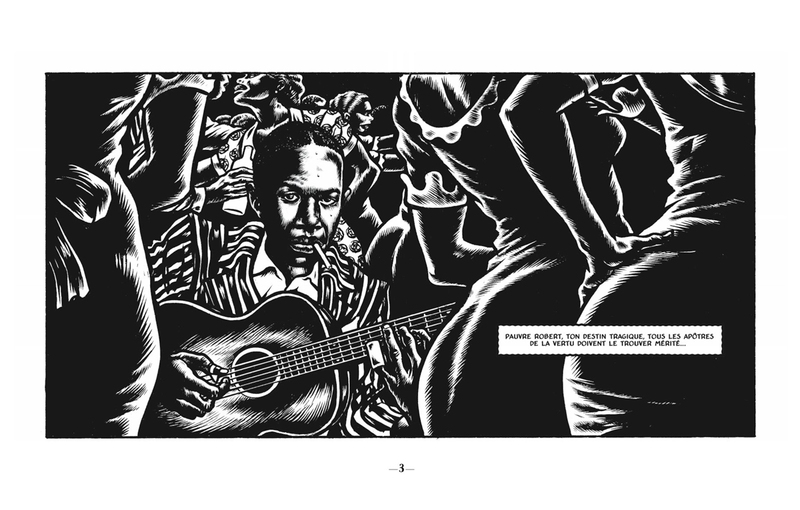 Love in Vain tackles one of American pop-culture’s most enduring, mysterious, and interesting figures, bluesman Robert Johnson, and retells his life-story in a widescreen graphic novel format. Some might say that there is a certain redundancy in telling the life story of a musician, particularly one who’s sound was as unique and prophetic as Johnson’s, in a soundless medium; but J.M. Dupont’s non-fiction / prose-poetry writing style (newly translated into English from it’s original French by Ivanka Hahnenberger) and Mezzo’s scratchy, seedy, and filthy art style captures the existential darkness that was the center of Johnson’s best songs. And why you burned your life to hell. This is the tale I’m here to tell. Dupont’s prose / poetic style is simple and clean-cut, and suspiciously doesn’t try to invoke the lyrical simplicity of Johnson’s own writings. There’s a clue here in who the true narrator is of the comic – a revelation that comes in the final page’s glory of excess and debauchery. However, as good as Dupont’s writing style may be, the true artist-supreme of the book is Mezzo, who’s scratchy, stark black and white illustrations illuminate each and every wide-screen vista. Where Dupont’s writing might skip on some of the psychological ramifications of Johnson’s costly lifestyle, in Mezzo’s artwork the costs are writ clear on Johnson’s tortured face. He might be portrayed as debauched and amoral, but Mezzo imbues his illustrations with the secret, silent suffering that Johnson endured through all his trials. No illustration communicates this more than a scene set just after Johnson has buried his wife and child. Mezzo’s illustration invokes Bertolt Brecht’s silent scream – a howl of pain that cannot be uttered for fear of revenge from a force beyond your comprehension. It’s a howl of pain that carries throughout all of Johnson’s bleakly nihilistic music. It’s a howl that his many imitators have crafted into the very bones of all contemporary music, from hip-hop to rock. Hahnenberger’s translation reads: Some would say that God made Robert suffer to test his faith. I’m not so sure – I think he knew that this lamb was a wrong ‘un, and so he struck him down and cast him out of the flock. There are few faults that one can find in Dupont and Mezzo’s extraordinary exploration of the life of Robert Johnson. I can only say I finished this comic wanting to know more – it’s brevity is both it’s success and it’s failure. I suppose it corresponds to the general lack of information regarding Robert Johnson’s life and death; the mists of time have obscured him forever beyond our reach. To extend the page length, Mezzo provides an illustrated song book, setting a few of Johnson’s lyrics alongside some murky charcoal portraits. His illustrations evoke the lyrics brilliant way. Ultimately, this graphic novel ranks among the best artistic expeditions into the life of Robert Johnson. You’d be a sucker to miss it out. Next On the ethical implications of punching Richard Spencer.